The tsuba is lined with tribal Dragon head artwork keeping watch while you wield the forged carbon steel blade. Heat tempered, the carbon steel blade comes sharpened and sports a deep blood groove. Sharpened carbon steel blade with blood groove. All metal tsuba (guard) and fittings. Dragon Energy artwork painted onto the scabbard. Black nylon cord handle wrapping with matching scabbard wrap. Hardwood scabbard with high gloss piano paint finish. Measurements: 26 1/2 in. blade, 40 3/4 in. overall. For more than 2600 years, the ""City of Treasure Sword"", Longquan, is known for making the best swords in the world. Located within the border of South Zhejiang, and under the Fengyang Mountain, Longquan is rich in resources which are ideal for crafting swords. I was shocked at the poor quality of this blade. Other than the metals used in the blade I have seen better swords for 20 bucks. When it arrived the saya was scratched, the shitodome and the kurikata had fallen off, the ito was not wrapped properly so I fixed it and after a couple of swings it was messed up again, the blade hardness was disappointing, the inside of the saya was poorly constructed and rough, and worst of all mine was showing signs of rust when it arrived. 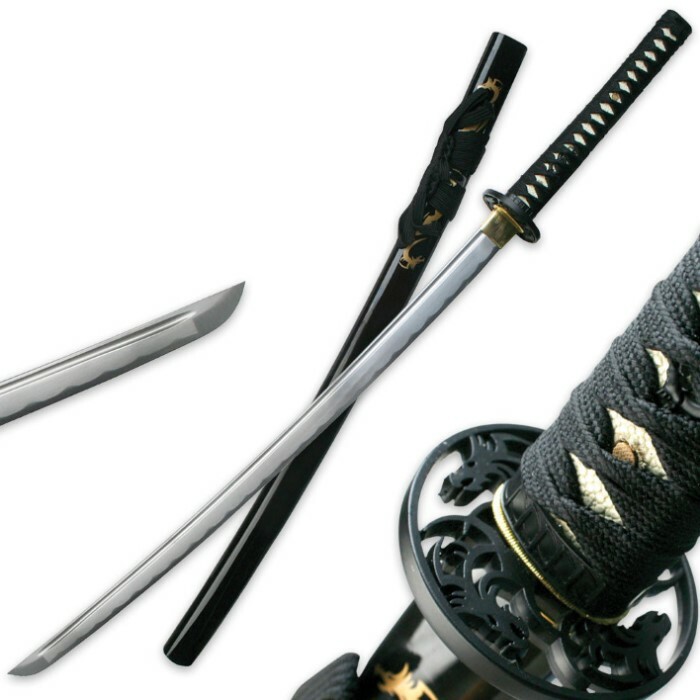 The sword however is beautiful, I love the dragons on the saya and the tsuba is awesome. If anyone else is willing to give this sword a try I hope it gives them no problems. Sharp right out of the box, well balanced. Bought as just a beat around working sword and it performs well for that, testing right now to see how well it holds it's edge. All parts fit tight with no rattle, but the tsabu will probably not take a good hit without breaking but hey this is only a $70 sword so don't expect too much. Gave it 4 stars because it actually exceeded my expectations in qquality for price.